Brett Ligon’s first term as District Attorney has literally transformed the DA’s office into a professional, ethical and aggressive advocate for the citizens of Montgomery County. Specialized divisions including Public Integrity, Crimes Against Children, Domestic Violence, White Collar / Civil and Environmental bring resources to these complicated case types. Brett received the Mother’s Against Drunk Driving Special Achievement award for his efforts in combating DWI’s. Ligon created Montgomery County’s nationally recognized No Refusal Program, which decreased the number of Intoxication Manslaughter cases by over seventy percent. Named the Auto Theft Task Force Prosecutor of the Year in 2010, Brett’s leadership has resulted in great strides in property crime prosecution. Ligon serves on the board of the Texas District and County Attorneys Association, working to solve legal issues and create effective legislation. Brett provides ongoing training to local law enforcement, prosecutors and the public. He created the Major Crimes Response and Vehicular Crimes Teams to assist local law enforcement to more effectively investigate with the trial in mind. In conjunction with Judge Claudia Laird, Brett Ligon made victim’s rights a top priority with a landmark Domestic Violence Court and Specialized Prosecutor. His revolutionary “Direct File” system expedites disposition of cases and saves taxpayer money. 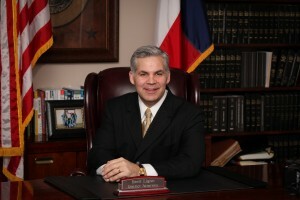 Brett Ligon was voted Montgomery County’s Boss of the year in 2009 for restoring the public’s faith in the criminal justice process, and the District Attorney’s Office. Brett Ligon’s changes at the office were recognized again by Montgomery County when the District Attorney’s Office was named “Department of the Year” in 2010.